The Eppendorf Mastercycler Ep 384 Thermal Cycler System brings you reliable and fast gradient PCR cycling for the best in optimized reaction conditions. This Gradient PCR system uses SteadySlope technology for consistency in heating and cooling rates for results that are simple to transfer to more routine applications. The gradient temperatures of this thermocycler is freely programmable over 12 rows up to 20°C, allowing for annealing temperature and all steps of a PCR protocol. The Eppendorf Mastercycler Ep 384 Thermal Cycler System uses an aluminum block, which is a great conductor of heat and will heat uniformly throughout. Control of this PCR system is easy thanks to the Cycle Manager Pro software, that gives you a high degree of flexibility, and guides users with a easy to understand graphic interface. Ramp rates on this thermal cycler system are variable, and users can set parameters such as time, temperature, alarm ranges, auto restart dialing, and stores up to 700 user defined PCR programs. Users also have the option of using the personal card system that facilitates reliable transfer of personal protocols between PCR workstations or can be used to have unlimited memory expansion. 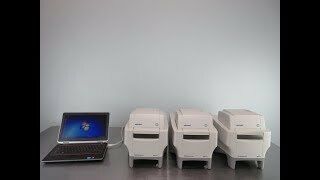 This Eppendorf Mastercycler Ep 384 Thermal Cycler System has been thoroughly inspected and each has been validated for temperature. All of our lab equipment comes backed with our standard warranty. Should you have any questions, please don't hesitate to contact us.